We acknowledge the financial support of the Government of Canada through the Canada Magazine Fund for the creation of this website. 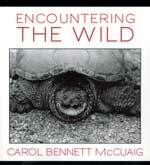 This book is a celebration of the vast array of wildlife studies ongoing in Algonquin Park. This is also a book about Ontario's flagship park and one of the foremost canoe-tripping wilderness sites in the world -- a must for both seasoned and budding naturalists. Natural Heritage Book. ISBN 1-896219-28-4, Size: 6 x 9 paperback, 246 pages. Carol’s keen powers of observation, coupled with her insights into wildlife behaviour and her evocative writing style, have produced this captivating collection of stories. This is a delightful book that will appeal to country-lovers in Canada and beyond. Natural Heritage Book. ISBN 978-1554888580, Size: 9 x 9 Paperback, 230 pages. The mighty polar bear. The plucky beaver. The majestic caribou. These iconic animals are etched in our national consciousness (and on our coins), but they represent only a small fraction of the amazing variety of mammals found in Canada’s wild. This guide meets the needs of everyone from the professional to the amateur naturalist out for a weekend trek. A Lone Pine book. ISBN 13 978-1-55105-856-6, Size: 6 x 9 Hardcover, 448 pages. Drawing on years of first-hand observations and on a careful reading of the latest scientific literature, biologist/author Adrian Forsyth has produced an invaluable reference that combines a highly readable text, the authority of a field guide and the stunning beauty of North America's finest wildlife photography. A Firefly Book. ISBN 1-55209-409-X, Size: 9 x 11 hardcover, 350 pages. The Kawarthas sit astride the Canadian Shield and fertile lands to the south. This is cottage country—a place where people are closer to nature and where children and adults remark on the sightings of animals, birds, and butterflies from windows and lakeside chairs and ask questions about what they see. This book is a valuable asset and will answer many of these questions. It offers an alternative to a shelf of field guides and deals with what can be expected in a relatively small but uniquely rich environment close to home. ISBN 978-1459701151, Size: 9 x 9 PB, 190 pages, Dundurn. 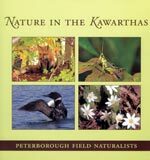 This book features over 400 species of plants and animals that you will commonly encounter in Ontario. Includes native uses for plants, animal behaviour, ecology and range and colour maps of all regions showing parks and nature areas. The most ancient and least disturbed forest ecosystem in eastern North America clings to the vertical cliffs of the Niagara Escarpment. 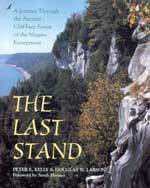 The Last Stand reveals the complete account of the amazing discovery of these unique eastern white cedar trees and the amazing properties they possess. 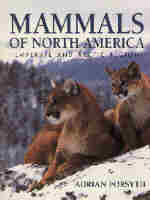 ISBN 978-1-897045-19-0, Size: 8 x 10 paperback, 162 pages, A Natural Heritage Book. With sensitivity, enthusiasm and empathy for wildlife, this celebrated nature writer tells the story of animals who inhabit the lakeside near his backwoods home. ISBN 1-896219-52-7, Size: 9 x 9 paperback, 228 pages, A Natural Heritage Book. Celebrating the wolf, this book is a primer on wolf biology, a history of wolves in Canada and an extensive overview of our conservation activities. A Lone Pine book. Brilliant images, lively text and accurate mapsyour best guide to North America's magnificent wild animals. Covers 450 species in all, with more than 1,100 photographs, and organized for quick and convenient use, with pictorial tabel of contents, one page index, and colour tabs for sections. Index doubles as a life list. Over 600 drawings and 65 colour paintings portray represetative species of the 111 families of North American beetles. Peterson guides are designed to work in the field. A Houghton Mifflin Book. ISBN 0-395-91089-7, Size: 4 3/4 x 7 1/2 Paperback, 368 pages. This newly designed guide features descriptions of 524 species of butterflies. One hundred colour photographs as well as 348 colour range maps accompany species descriptions. A Houghton Mifflin Book. ISBN 0-395-90453-6, Size: 4 3/4 x 7 1/2 Paperback, 486 pages. In one easy-to-carry volume, this comprehensive field guide includes plants and wildlife it would otherwise take ten field guides to cover -- all the flora and fauna you're most likely to see in the forests of eastern North America. With 53 colour plates and 80 colour photos illustrating trees, birds, mammals, wildflowers, mushrooms, reptiles, amphibians, butterflies, moths, beetles and insects, this is the one field guide to carry. A Houghton Mifflin Book. ISBN 0-395-92895-8, Size: 4 3/4 x 7 1/2 Paperback, 488 pages. More than 370 edible wild plants, plus 37 poisonous look-alikes, with 400 drawings and 78 colour photographs showing precisely how to recognize each species. Hummingbirds and butterflies are some of the most beautiful visitors to a backyard, but they can also be some of the most elusive. 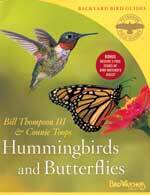 This book includes tips on how to attract hummingbirds and butterflies to backyards—and how to identify them once they've arrived. Included is: where they live, what they eat, and the best garden plants to attract them. A Bird Watchers Digest and Peterson Field Guides book. ISBN 978-0-618-90445-7, Size: 7 x 9 Paperback, 288 pages. This readable, friendly guide is intended for bird watchers and non-bird watchers alike—for anyone who wants to enjoy nature right inhis or her own backyard. In an easygoing and lighthearted style, seven chapters cover all the elements needed to attract birds to a backyard and address special cases and problems. 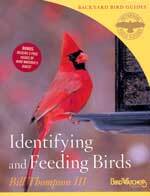 The final chapter profiles the 125 species most common at backyard feeders. A Bird Watchers Digest and Peterson Field Guides book. ISBN 978-0-618-90444-0, Size: 7 x 9 Paperback, 246 pages. Detailed descriptions of insect orders, families, and many individual species are illustrated with 1,300 drawings and 142 superb colour paintings. Includes a glossary of technical terms. A Houghton Mifflin Book. ISBN 0-395-91170-2, Size: 4 3/4 x 7 1/2 Paperback, 404 pages. With more than 300 colour photos, this new edition shows how to identify more than 500 healing plants. Includes known medicinal uses and organized by colour. 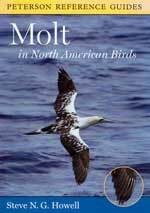 A comprehensive and accessible guide to molt, a fundamental yet often overlooked aspect of bird identification. Grouped by colour and by plant characteristics, 1,293 species in 84 families are described and illustrated. More than 100 speciesall the animal tracks most commonly seen across the United States and Canada. For hiking, biking, or a stroll in the country...the perfect fast and easy reference. A Houghton Mifflin Product. ISBN 0-395-82997-6, Size: 4 1/2 x 8 1/2, 24 colour fold-out panels that are plastic laminated to resist water damage and soiling. More than 100 species all the birds most commonly seen in neighourhoods across the United States and Canada. For hiking, biking, or a stroll around the block... the perfect fast and easy reference. A Houghton Mifflin Product. ISBN 0-395-79290-8, Size: 4 1/2 x 8 1/2, 24 colour fold-out panels that are plastic laminated to resist water damage and soiling. More than 100 species all the butterflies most commonly seen across the United States and Canada. A Houghton Mifflin Product. ISBN 0-395-82996-8, Size: 4 1/2 x 8 1/2, 24 colour fold-out panels that are plastic laminated to resist water damage and soiling. More than 100 species all the most commonly seen birds along hiking trails of the eastern United States and Canada. For hiking, biking, or a stroll in the country... the perfect fast and easy reference. A Houghton Mifflin Product. ISBN 0-395-79288-6, Size: 4 1/2 x 8 1/2, 24 colour fold-out panels that are plastic laminated to resist water damage and soiling. All the day-flying birds of prey in North America. For hiking, biking, or a stroll in the country... the perfect fast and easy reference. A Houghton Mifflin Product. ISBN 0-395-79291-6, Size: 4 1/2 x 8 1/2, 24 colour fold-out panels that are plastic laminated to resist water damage and soiling. More than 100 species all the wildflowers most commonly found along roadsides across the United States and Canada. For hiking, biking, or a stroll around the block... the perfect fast and easy reference. A Houghton Mifflin Product. ISBN 0-395-82995-X, Size: 4 1/2 x 8 1/2, 24 colour fold out panels that are plastic laminated to resist water damage and soiling. More than 100 species all the trees most commonly found across the United States and Canada. For hiking, biking, or a stroll in the country... the perfect fast and easy reference. A Houghton Mifflin Product. ISBN 0-395-82998-4, Size: 4 1/2 x 8 1/2, 24 colour fold-out panels that are plastic laminated to resist water damage and soiling. More than 50 species all the waterfowl most commonly seen across the United States and Canada. For a walk around the lake, or a paddle into a wilderness wetland... the perfect fast and easy reference. A Houghton Mifflin Product. ISBN 0-395-86734-7, Size: 4 1/2 x 8 1/2, 24 colour fold out panels that are plastic laminated to resist water damage and soiling.